Thomas Newman was born on July 21, 1946, in Milwaukee, Wisconsin. He enlisted in the U.S. Air Force on February 26, 1965, and was trained as a pararescueman. His first assignment was with Headquarters Aerospace Rescue and Recovery Service at Orlando AFB, Florida, from February to May 1966, and then with the 79th Aerospace Rescue and Recovery Squadron (ARRS) at Andersen AFB, Guam, from May 1966 to December 1967. Sgt Newman then deployed to Southeast Asia, where he served with the 40th ARRS at Nakhon Phanom Royal Thai AFB, Thailand, from March 1968 to February 1969, at which time he returned to the U.S. and left active duty. He remained in the Air Force Reserve until February 25, 1971, and rejoined the Air Force on January 28, 1972. Sgt Newman returned to the pararescue career field, serving with the 67th ARRS at RAF Woodbridge, England, from October 1973 to October 1976, and then at Kirtland AFB, New Mexico, until 1979. He left active duty a second time on September 4, 1979, and then completed his bachelor's degree and received a commission as a 2d Lt through the Air Force ROTC program on February 7, 1981. His first officer assignment was as a military instructor and then assistant chief of the Services Division with the International Officer School, Air University, at Maxwell AFB, Alabama, from February 1981 to July 1985. 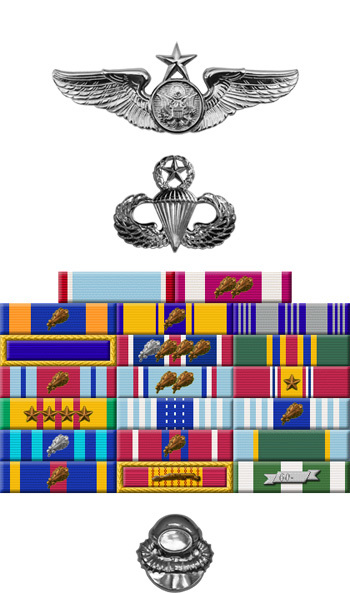 His next assignment was as an instructor at the Air Force Survival School with the 3636th Combat Crew Training Wing at Fairchild AFB, Washington, from August 1985 to July 1990, followed by service as an analyst and section chief with the Air Force Occupational Measurement Squadron at Randolph AFB, Texas, from August 1990 until his retirement from the Air Force on November 1, 1994. 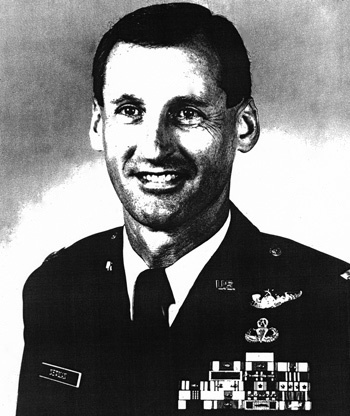 The President of the United States of America, authorized by Title 10, Section 8742, United States Code, awards the Air Force Cross to Sergeant Thomas A. Newman for extraordinary heroism in military operations against an opposing armed force as an HH-3E Helicopter Pararescue Specialist in Southeast Asia, on 30 May 1968. On that date, Sergeant Newman voluntarily descended into a hostile jungle environment to rescue a downed Air Force pilot. With complete disregard for his own life, and hampered by darkness and concentrated automatic weapons fire, he requested the rescue helicopter above him to enter a nearby orbit, both for the safety of the crewmembers, and to prevent the hovering aircraft from establishing the survivor's location for the unfriendly ground forces. When the rescue helicopter returned, he secured the injured airman to the forest penetrator and protected him with his own body as they ascended to the helicopter. Through his extraordinary heroism, superb airmanship, and aggressiveness, Sergeant Newman reflected the highest credit upon himself and the United States Air Force.